Bird’s Don’t Just Fly – So What DO they do? Ok maybe not so light. But our hearts were light on that early Tu B’Shvat morning, the birthday of the trees. It’s a day that symbolizes new beginnings, and rebirth. The gentle pink/white almond blossoms greeted us in their silent caress. Perched on some rocks, we started the song. Our breath sent out chilled steam in the cold, morning air. I first heard the Shakira song, “Try Everything” (written by Sia Furler, Tor Hermansen, and Mikkel Eriksen) from my daughters. Especially my younger daughter, Sara Malka, who was, for the longest time, singing it constantly. The message seeped into my subconscious before I even realized what I was hearing. I often get immersed in my creative songwriting/recording process, and I don’t even think of doing a cover song. But when my older daughter Rivka suggested that I sing this song, she understood the gift that she was giving me. I focused in on the words, I knew that it was exactly the message that I needed to hear. This line from Psalms hints at the truth that has carried me through the hard times. We can influence our beliefs, our inner voices, our lives, by the songs we choose to sing. And this song’s message is just what I need to hear right now, at this time in my life. This time in my life. The most beautiful, though not the easiest. This time. In my 40’s. Single mother of 3. Youngest child aged 5. This time. Far from my family, living in the holy city of Tzfat, Israel. This time. Learning to thrive beyond surviving after escaping an abusive marriage five years ago. This time. Watching my children thrive, grow in confidence, and learn how to embrace their own existence. This time. Amazing friends; loving friends who are like a family surrounding me. Reminding me when I fall, that I always get up again. This time. Working on my 11th album of original music. This time, set to Rumi’s poetry. New songs. New jams. My life is full of music, of voices, of healing tunes. This time. Struggling to make ends meet. 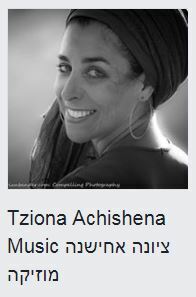 Bringing Music and Memory programs to Israeli nursing homes. Learning how to do this while I go. This time. Dreaming of love, of that elusive soul mate. Wanting a man to share my life and my love with. Sometimes tired of facing everything on my own. This time. Realizing that my dreams of love are holding me back. Distracting me from what is in front of me. Draining my energy away from what is really here, right now. I decide to go for my life; for what I want, fulfilling my potential and doing the work that I am meant to do. I came to sing, and to share the healing power of music. “I believe because I speak”: if love is meant for me, he will come. I will focus my energy on now. I am love. This day. This song, now. This time. Singing another song. Not giving up. Getting up for another day, filled with the mundane, the miraculous, and the beautiful. This time. Getting plucked from my everyday life to Moscow, Russia for a gig that got hundreds of women dancing. Traveling and singing with my daughter at my side. This time. Flexing my gratitude muscles. Focusing on all that I have; being grateful for it all. This time. Structure, commitment. A video every week. A blog post every week. Even when I’m tired. Even when I’m flying to Russia the next morning. Do I have the discipline? I want to try everything. I’ll try. This time. Teaching a group of teenage singers to improvise. Watching them fly. This time. More students, dentists, doctors, horseback riding lessons, dinners to make happen. Groceries to be bought. This time. Raising money for a music video for my original song. It’s scary. What if I try and fail to raise the money? This time. Early morning. Gan Sacher. Because I didn’t hold back, and because Shira Lankin Sheps and The Layers Project Magazine believed in me and my voice, this unexpected beautiful video is all of sudden happening. This time. 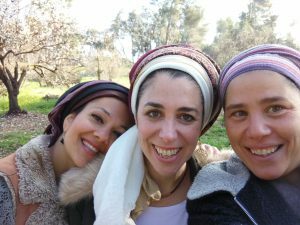 Hadar and Sharon at my side. I am looking at their faces while we play. Their beauty. Their generosity. 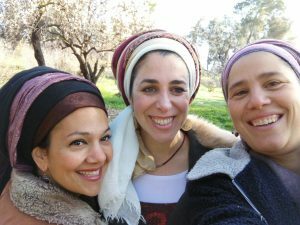 Sharon tying my head scarves so beautifully, Hadar schlepping her baby all the way from the Golan Heights. A week later, Hadar will be comforting her babies on Shabbos morning when the sirens sounded, and the bombs blast. Hadar’s rolling drum keeps me moving, up. In the center from the ups and downs. Her gentle smile and angelic face always relax me and help me tap in to Music. She’s been drumming with me for 15 years, going to every corner of Israel, supporting, always positive, always loving, royalty. Sharon. Every note that she sings is a right one. Supporting, positive, loving. She takes the wheel driving to Jerusalem when she realizes I’m barely driving the speed limit. I see on their faces reflected the innocent love of music that unites the three of us in this place. That vibe, that click; when it all falls in place and the music comes alive. We come alive. Singing our lives. Always another song. This time. Not giving up. Music Heals. I am a part of this. Each of us picks a card which contains a single word. Hadar gets Royalty. Sharon gets Divine Influx. I get Inspiration. Sounds about right. This time. Not holding back. Not waiting. I can’t wait anymore. I have to believe in myself. To stop pretending I don’t care about anything but the creative process. I do care. I want you to hear my music, my voice. I have to just do it. It’s a long song, I have been singing. I’ll just sing. And sing. And sing. At some point making mistakes is less scary than holding back. This time, is when silencing myself in any way, holding back, or numbing my will has become the most frightening thing imaginable. Scarier than failure. Scarier than falling flat on my face. This time, when I am imagining the next world, and wondering, “will they ask me why? Why I was afraid to be me? Why I was afraid to be seen? Will I be held accountable for the songs unheard? This time. That Tu B’Shavat morning. When the trees are a minute away from death, but the sap begins to rise. That moment when the seed disintegrates, and everything seems lost. And the sprout grows again. When life seems over, and its just beginning. Again, and again, and again…. ← Previous post:What Is The World’s Oldest Musical Instrument? You’ll Never Guess! Thank you Amy! It’s such a personal post; your response warms my heart.